One of the benefits of going to great lengths to style our curly hair is that it just looks amazing when we find a combo we like! Even better is the fact that we curlies can often have hair that looks BETTER the next day (AKA “second-day hair”). We hear so much about curlies who get great second-day hair, but is it possible for that same fantastic look to just keep getting better and better as the days pass? Yes it is! If you’re accustomed to washing your hair daily or every other day, you may be wondering why someone would not do anything to her hair for several days. The reason is that most curly girls (of all hair types) seem to benefit from next-day hair. When our hair has had a chance to “settle in,” we tend to like it better! This is especially true if you apply any heat to your hair. Going with second-day hair also lets us enjoy our curls even longer! Because the natural oils found on the scalp have a difficult time running down the shaft of curls, the longer we skip the shampoo and the wash, the better our curls can look (to an extent of course). Second, third and fourth day hair is often bigger and more stretched out, giving you a different look the au natural way. Second, third and fourth day hair is often bigger and more stretched out, giving you a different look the au natural way. It may sound astonishing, but it really is possible to have that great second-day hair roll over into fourth and even fifth day hair. One of my tween daughters, a 2b/3a girl, likes doing bantu knots in her hair. The next day, she’s got some super-tight, bouncy curls (think Nellie Olsen here). She’ll flip her head upside down and shake gently, and then she’s pretty pleased with the results. However, as the days go on (she’ll usually let it go three or four days), it still looks great and in some ways, better! She doesn’t really do much of anything to it except spritz it with water and scrunch a little. In fact, she’s pretty careful not to handle it too much so she doesn’t cause it to frizz. 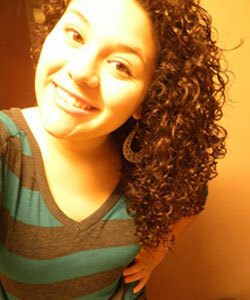 CurlTalk user “fabisebien,” who appears to be a 2c and says she has fine hair, has had similar results with her curls. She was kind enough to share a photo with the community of how her hair looked five days later. Fabisebien says her routine for maintaining during those five days was “just add water” and to rub in a little more of her favorite As I Am Leave-In Conditioner, to help define curls. If you are worried about dirty roots, dry shampoos are all the rage in the curl girl market and are paraben and sulfate-free. You can keep your curly style and boost your roots, even five days after the co-wash or pre-poo. Enjoy your curly hair and just consider being able to look better each day while doing nothing to it as a fringe benefit!